If you're looking to get into planted aquariums one of the first plants you usually come across is Vallisneria. This sea grass-like plant is great for beginners and looks very decorative but the most popular Vals come with a bit of a challenge: they grow pretty massive. Luckily there are also smaller varieties and the curly-leaved corkscrew Val (Vallisneria asiatica) is one of them. The right size for a shrimp tank but still just as easy to grow. Keep reading for everything you need to know about corkscrew Vallisneria and growing it in your own aquarium! Corkscrew Vallisneria is quite easy to grow and relatively undemanding. No added Co2 or complicated nutrient dosing schedule needed, which makes it a great option for beginners. The only important factor to keep in might is lighting: this Val does need quite a bit of light. When provided with this it will grow very quickly, constantly sending out runners. You can leave these baby plants to grow or disconnect them from the main plant if you'd like to replant, remove or sell them. For a healthy corkscrew Vallisneria, plant it directly into the substrate, making sure not to bury the leaf base (crown). In small setups like shrimp tanks this plant works best in the background or at the sides of the tank. Some root tabs will be appreciated, as they provide extra nutrients and help encourage faster growth. Give the plant some time to establish and you should see new growth and even runners in no time! Be sure to do regular maintenance by removing any dead bits and pruning the leaves with sharp scissors if they're getting too long. In herbivore tanks: Vallisneria is appreciated by aquarists who keep herbivorous fish and fish that like to dig around the substrate. It grows very quickly, which means it should be able to withstand the occasional nibble. It also forms rather extensive roots systems quite quickly, which means it's not easily uprooted. Hiding place: Many fish species (and shrimp too!) appreciate having plenty of places to hide. Its tall, sea grass-like leaves and bushy growth pattern make Vallisneria the perfect plant to offer some extra cover. Foraging grounds: All plants are appreciated by shrimp because their leaves contain a layer of biofilm and, in some cases, algae. 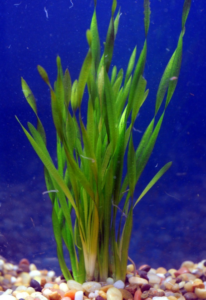 Vallisneria has long leaves with a large surface area, so all the more room for that yummy shrimp food to grow. Coldwater aquariums: As discussed earlier Vals like Vallisneria asiatica can handle a wide range of temperatures. This makes it a great choice for shrimp keepers who like to keep their tanks at room temperature. We've listed 68 °F as the minimum for this plant here but it can likely easily take even lower temperatures. Nitrate buster: Fast growing plants need more nutrients than slow growing ones do. These nutrients include nitrate, which is the natural end product of the nitrogen cycle but can be harmful to fish and especially shrimp in large concentrations. So although all plants help keep your tank stable by reducing nitrates, Vals are especially effective due to their quick growth. That doesn't mean water changes are out of the question, though - you still have to do those regularly. When buying Vallisneria asiatica, keep in mind that not all plants are correctly labeled. There is another Val that goes by the common name "corkscrew Vallisneria": Vallisneria tortifolia. Luckily both are easy to grow, which means it's not too much of a problem is you end up with the wrong variety. There are many different Vallisneria varieties out there and Vallisneria asiatica is only one of them. Unfortunately this is one of the less common Vals and it might be a little difficult to find in your local aquarium store. Luckily you can also easily buy it online; The Shrimp Farm sells corkscrew vallisneria and ships it right to your front door. You can find and order it here.